Home Brew .. Shop Online or In Store? Before working with Edwards Essences, I’d never been in a home brew shop. I had the idea they were populated by old blokes who brewed cheap beer that sometimes worked and regularly didn’t. I admit my views were coloured by my grandfather’s brewing. As a child I was convinced the toilet was called the ‘thunder box’ because Grandad’s beer was kept in the combined laundry toilet and his bottles regularly blew up! I can assure you visiting the toilet at his house was a quick and terrifying experience. Back to home brew shops and the topic at hand. I have since discovered home brew shops are amazing places, providing an adventure into making all sorts of home produce, not just beer! Many stock wonderful ingredients and equipment for making your own sausages, bread, cheese, tofu, fermented foods, spirits, etc. The beer process has also greatly improved in terms of ease of production, variety, reliability and taste. 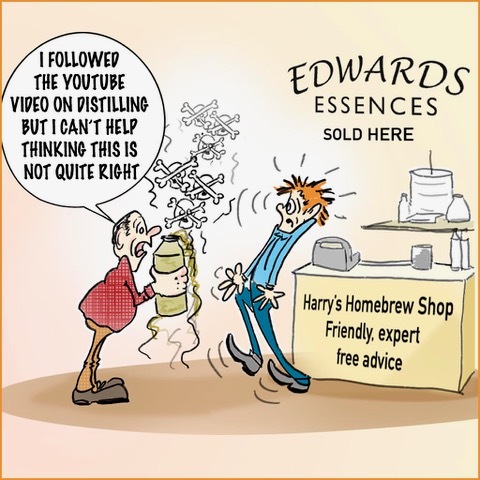 All good Home Brew shops also stock Edwards Essences products. With a range of 43 flavours, the essences are designed for adding to a spirit base to produce alcoholic beverages that mimic many of today’s popular commercial brands. Which brings us to the contentious issue of brewing spirits. As distilling your own spirits is illegal in Australia, Edwards Essences advocate the use of a commercial alcohol base such as vodka. Having said that, of course many people make their own distilled spirits. So why is distilling illegal in this country? One reason is people have accidentally died by incorrectly distilling and thereby poisoning themselves. This was the case with the well publicised event in 2013 where young men drank their Grandfather’s grappa and two subsequently died. I sincerely doubt they consulted anyone who had reliable knowledge in the area of home distilling. If they had, they most likely would be alive today. With large taxes imposed on commercial alcohol, especially spirits, some sceptics think Governments are fiscally motivated in their imposition of prohibition on the home distilling of alcohol. Prohibition or not, people have been distilling alcohol for thousands of years. The ingredients are readily available and the process is relatively easy, so policing distilling is difficult. However, as has been proven by cases such as the aforementioned, home brew is not without risk. Professor Paul Haber, the head of Drug and Alcohol Services at the Royal Prince Alfred Hospital in Sydney, says distilling alcohol is a complex process. “The backyard still involves fermentation, which generates a large range of biological products,” he said. Which brings me finally to the area of should you shop on-line or in shop? On-line businesses are booming. On the plus side, not only is it a convenient way to shop but it is also often cheaper. On-line shops can offer discount prices as they are not carrying the cost of running a physical store. The downside of on-line shopping is you need to know exactly what you want AND how to use it. But, as my 22 year old son pointed out, “there is always YouTube”. The question is, how much can you trust someone on YouTube? As far as I can ascertain, there are no guarantees on the quality of advice offered on YouTube, nor can you follow up with your YouTube ‘expert’ if something doesn’t work. On the other hand, a physical shop front is often owner operated and/or has staff experienced in home brewing. This means they are placed to offer advice on process, products and safety (including pouring Grandpa’s grappa down the sink!) Not only do you receive advice and know how, the shops are a treasure trove of interesting products. Who knew making sausages or bread could be so easy or rewarding?! Like many small retail stores, Home Brew shops are struggling to compete with on-line shopping. However, this challenge to their business model has meant many have stepped up to the mark and are providing a greater level of service, free advice and fabulous products. If you have never been to a home brew shop, it’s time to step through the door and experience something different and exciting. With their help, in no time you’ll be making your own wonderful products, just like a seasoned pro!